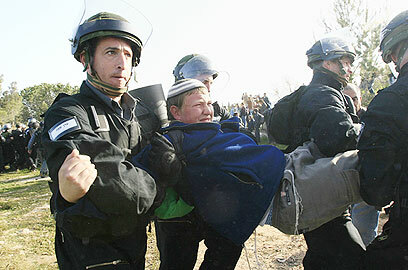 Large numbers of police and IDF officers started evacuating the activists, mostly teenagers, at about 7:30 a.m. Some of the youths at the place have tried resisting and cursed the policemen, who carried them by force into buses. After having spent two days at the site, the activists were ordered to leave Homesh on Wednesday. Some 700 policemen took part in the operation, alongside 300 soldiers who secured the evacuation. Police have notified the activists that Homesh was a closed military zone and that they must leave the place immediately. The settlers spent the night setting up barriers using stones in order to make the evacuation more difficult. On Tuesday, police officials warned that should the settlers fail to evacuate willingly, the government would be inclined to give the green light for the forceful evacuation of the several dozen teenage settlers who vowed to put up a tough resistance. The police are preparing for the evacuation of hundreds of settlers who reoccupied the settlement of Homesh which was evacuated and destroyed in the summer of 2005 under Israel’s disengagement plan. Police officials said should the settlers fail to evacuate willingly, the government would be inclined to give the green light for the forceful evacuation of several dozen teenage settlers who vowed to put up a tough resistance. Hundreds of settlers heeded police calls to evacuate the former West Bank settlement which was declared a closed military zone by the army following the 2005 disengagement plan of former Prime Minister Ariel Sharon, but many teenagers remained there. “Our aim is not to confront the security forces but to build Homesh anew and therefore, as far as we are concerned, the issue is not a struggle. If they evacuate us we will return,” said Yossi Dagan, an organizer of the plan to reoccupy the former settlement. 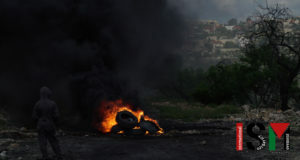 The army blocked roads leading to the settlement on Monday night to stem the flow of settlers. Despite the army’s measure, Zefat Chief Rabbi Shmuel Eliyahu managed to reach Homesh along with a dozen right-wing activists and gave Torah lessons to teenage settlers on the ruins of the former settlement. Settlers slammed the army for not allowing them to provide food, water and medicine to their comrades in Homesh. 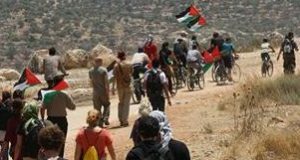 “If people dehydrate, this will fall under the responsibility of the political elements who gave the army these orders,” settlers said. 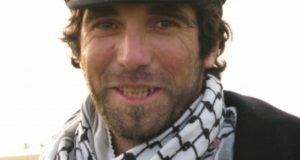 The Chairman of the National Union-NRP faction, MK Uri Ariel, described the army’s attitude towards the settlers as “inhumane,” charging that the military allowed food supplies into former Palestinian Authority President Yasser Arafat when he was besieged in Ramallah. “Homesh was rebuilt yesterday, and even if the prime minister and defense minister decide based on small political evaluations not to fix the mistake of eviction and evict us for a second time from our land, we will return to Homesh and rebuild the settlement again,” said Dagan.